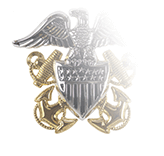 Proficiency with pistol and rifle have been award-worthy skills in the Navy since 1920. 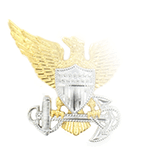 The name and design of the award have changed, but any member of the Navy—no matter what rank, rate, or rating—may qualify for the Navy Rifle Marksmanship Ribbon, Navy Sharpshooter Award, and Navy Expert Rifle Medal (the latter is called the Navy Expert Rifleman Medal in the Navy and Marine Corps Awards Manual, SECNAVINST 1650.1H). But while all Navy personnel are free to attempt to qualify, there are some—i.e., those armed with a rifle—for whom qualification is a requirement. Qualification must be done with a non-scoped M14 or M16A series rifle. Ten rounds divided into a pair of three-round magazines and a final four-round magazine are allotted to zeroing the sight. Forty rounds are fired at targets over the next five stages of the course; some sections allot up to a minute per round, while others require an average rate of fire of once every seven seconds. Firing is done from standing, kneeling, and prone positions. To earn the Expert medal and the “E” device for the Rifle Marksmanship ribbon, a score of at least 170 out of 200 is required. A score of 160 to 169 is rewarded with the Marksmanship ribbon and a bronze “S” Sharpshooter device, while a score between 140 and 159 rates only the Marksman ribbon. Navy personnel retain their Expert, Sharpshooter, or Marksmanship qualifications indefinitely, but they can move up to a higher rating (from Marksman to Sharpshooter, for example) by achieving a higher score on a subsequent qualification. 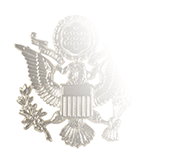 Designed by the U.S. Mint, the Navy Expert Rifle Marksmanship medal is a bronze disc with a smaller disc superimposed over the top. 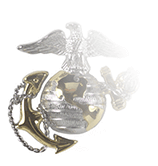 The top disc features an eagle with an anchor in its talons, the design taken from the Navy Seal. The bottom disc includes a boxed bull's-eye target with "Expert Rifleman" across the top and "United States Navy" curved below. The recipient's name is engraved on the blank back. 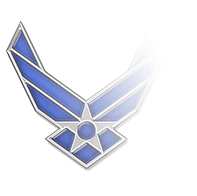 The medal hangs from a navy blue ribbon with three narrow light green stripes, one in the center and the other two near either edge.